Summary Tri-band Wi-Fi Range Extender based on MediaTek chipset. Linksys' RE9000 MU-MIMO Range Extender follows NETGEAR's EX8000 Nighthawk X6S Tri-Band WiFi Range Extender as the second "tri-band"/three-radio Wi-Fi extender to hit the streets. Linksys has decided to use price as its primary means of knocking the EX8000 down a peg or two in sales, given its current $170 price vs. the RE9000's $230. I'll be comparing the two throughout the review. The RE9000 combines a two-stream dual-band 802.11ac AC1300 class radio with a third, four-stream 5 GHz radio. 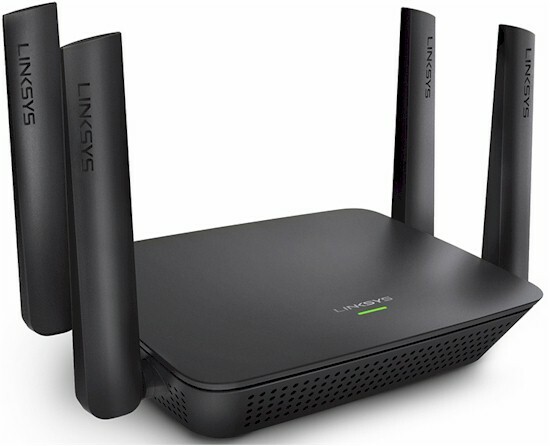 Maximum link rates of 400 Mbps (2.4 GHz), 867 Mbps (5 GHz) and 1733 Mbps (5 GHz) add exactly up to the 3000 Linksys uses as the RE9000's class rating. So far, this puts the RE9000 and EX8000 on equal footing. Both products always prefer to use the highest-bandwidth four-stream 5 GHz radio to connect back to the base router being extended, i.e. for backhaul. However, where the EX8000 uses the 5 GHz U-NII-3 high band (Channels 149-165) for its four-stream backhaul radio, the RE9000 uses the U-NII-1 low band (Channels 36-48). Since maximum allowed transmit power is now the same for both channel groups, this should have no effect on performance. But you'll want to make sure you change the base router 5 GHz channel to allow the RE9000 to take full advantage of its maximum bandwidth if you have a three or four-stream router. In the old days before Wi-Fi classification became the mess it now is, it was much easier to tell how many streams a router used. The simple approach for the RE9000 is, if in doubt, just set your base router's 5 GHz radio to 36, 40, 44 or 48. The more significant difference between the Linksys and NETGEAR, however, is that the RE9000 does not use the 2.4 GHz radio for backhaul. The EX8000 prefers to use its four or two-stream 5 GHz radios for backhaul, but will fall back to using 2.4 GHz if it can't connect on 5 GHz. I suspect this is a software limitiation and could be changed in a future firmware release. But when I confirmed the no-2.4 GHz-for-backhaul "feature" with Linksys, they didn't say they would be changing this limitation. In any event, the RE9000 is like most other of today's extenders and doesn't require your router to support WDS. The RE9000's connection wizard has a built-in site survey to make setup easy. The RE9000 is a compact little guy and could be mistaken for one of Linksys' remaining E1200 or E2500 N-class routers were it not for the four external dual-band antennas (not upgradeable). The LED callouts shows the single LED used to communicate status. I'm red/green color blind, so the choice of green and orange colors were not good for me. The rear panel callouts show the four Gigabit Ethernet ports, power port and reset button. There's also a WPS button on the right side. Each Ethernet port has a link/activity LED. One of the things you don't get with the RE9000's lower price is the ability to serve/share files from USB storage. The RE9000 can sit on a shelf or table but also has screw mounting slots on its bottom that allow pointing the rear connectors up or down. The RE9000's short term confidentiality period expired, so I was able to use the FCC internal photos. It's a little difficult to see in the photo below, but the two black cables connect the 2x2 2.4/5 GHz radio to the rear two antennas. The four gray cables connect the 4x4 5 GHz radio to all four antenna positions. Another FCC photo makes the RE9000's MediaTek platform pretty plain. Not called out here, but shown in a close-up photo is the MediaTek MT7621AT dual-core network processor powering the whole shebang. The white 5 GHz band filters are labeled with frequency values that make it easy to tell which radios are which. The table shows the key components of the RE9000 and NETGEAR EX8000 for comparison. The FCC photos didn't clearly show the RE9000's RAM and flash, so I used WikiDevi's guess. I could find no sign of any 2.4 GHz power amplifiers or front ends, by the way. Since the RE9000 can function as a tri-band AP, I first tested throughput vs. attenuation performance (or rate vs. range, aka rvr), using the Revision 10 Throughput vs. Attenuation test with the RE9000 in the large octoScope test chamber with turntable. The RE9000's 2.4 GHz radio was set to channel 6 and Auto (20/ 40 MHz) bandwidth. Keep in mind the octoScope Pal test client is limited to 20 MHz link rate, however. The RE9000's low band four-stream 5 GHz radio (Ch 36-48) was set to Channel 40 and Auto (20/40/80 MHz) bandwidth. The 5 GHz high-band two-stream radio (Ch 149-161) was set to Channel 149 and Auto (20/40/80 MHz) bandwidth. 2.4 GHz downlink shows the RE9000 and EX8000 are fairly evenly matched, with the Linksys having a slight advantage with the strongest signals, then falling below the NETGEAR as signal level reduces. 2.4 GHz uplink shows the RE9000 with a more sustained advantage over the EX8000. To keep the plots uncluttered, I've separated 5 GHz results into two-stream and four-stream plots. 5 GHz downlink - 4 stream shows the NETGEAR beating the Linksys, except for the 0 dB measurement outlier. 5 GHz downlink - 2 stream shows lower throughput for both products due to the lower link gain from 2 streams vs. 4. The EX8000 outperforms the RE9000, but disconnects 12 dB sooner. 5 GHz uplink - 2 stream results shows the same throughput disadvantage for the NETGEAR as the 4 stream results. Now that we know how good the RE9000 is as an AP, let's look at how it performs as an extender. As in the EX8000 review, the RE9000 was paired with a NETGEAR R7800 Nighthawk X4S, our top-ranked Qualcomm-based AC2600 class 4 stream MU-MIMO enabled router. The basic approach was to place the R7800 in one octoScope RF chamber and the RE9000 in another. The two are connected via a programmable attenuator used to ramp down the signal between the two, simulating performance at different "distances". The EX8000 review has more test setup details if you're curious. Here's the the RE9000 parked in an octoScope 18" chamber. Throughput between router and extender was measured with different connections to the RE9000: 2.4 GHz wireless, 5 GHz wireless and Gigabit Ethernet—with uplink and downlink traffic run in each case. One set of tests was run with the R7800's 5 GHz radio set to Channel 40, causing a four-stream backhaul connection; the other was with the R7800 set to Channel 149, resulting in a two-stream link. Each connection type was tested separately. Keep in mind that the backhaul connection is never used for client traffic. So if Channel 40 (four stream) is used for backhaul, Channel 149 is used for client connection and vice-versa. In both cases, the octoScope Pal test client is configured as a 2x2 AC STA. The first composite plot compares how client downlink throughput with a 5 GHz two-stream backhaul connection changed for each connection type, as the "distance" between R7800 and RE9000 increased, i.e. as attenuation increased. (Downlink is R7800 to RE9000; uplink is vice-versa.). The difference between the Ethernet and 5 GHz backhaul lines is fairly small, meaning that the RE9000 is pretty efficient in passing backhaul throughput along. 2.4 GHz throughput is obviously limited by the bandwidth of the client connection. The next plot compares throughput with the same setup, but with uplink traffic for each connection type. 2.4 GHz throughput is again limited by the lower bandwidth of that connection. Ethernet and 5 GHz throughput again track very closely. Next, the backhaul link switched to four-stream using Channel 40 and downlink throughput measured. Note the Ethernet-connected bandwidth increases even more at low attenuation values (higher signal levels), but the 5 GHz wireless connection can't follow because it's only a two-stream connection. 2.4 GHz is again limited to just below 140 Mbps maximum by the client connection bandwidth. Finally uplink with four-stream backhaul shows Ethernet bandwith maxing out around 600 Mbps, about 175 Mbps lower than downlink. However, it's still fast enough to not limit our two-stream 5 GHz test client and, again, much more than the 2.4 GHz client connection needs. The bottom line here is it appears the RE9000 has enough backhaul performance to handle two stream AC devices without choking off bandwidth. Keep in mind, however, that, unlike the EX8000, the RE9000 won't use the 2.4 GHz band for backhaul. This means you will have to place it closer to your base router.